"As far as I know, nobody can understand the happiness, the infinite emotion that I felt when I received this gift (My boyfriend, Greenmousa, understands me a little but he gave it to me so he's out of the equation). And because of that I can say THIS gift should be include in the Guinness World Records as 'The Best Gift For A Fangirl'. A Matías Bergara's original (if you don't know who he is, Matías Bergara is the illustrator of Sons of Anarchy's comic). This scene he drew is the most significant in the relationship between Chibs and Juice. 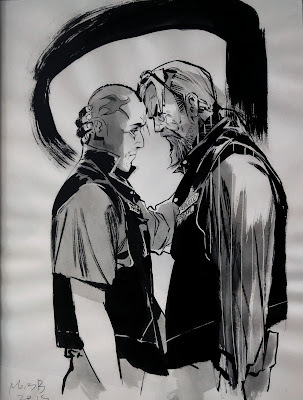 This interaction sould've happened earlier in SoA's storyboard and my heart hurts everytime I recall it. Even if you don't understand me, let me tell you... This illustration (it's already framed and soon to be hanged in my new place) is everything for me. And because of that, thanks”. But here? In this blog? I know you can understand me. A new FL is in progress! My first FL is now open!